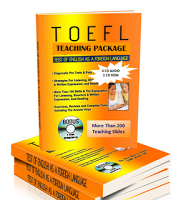 The paper version of the TOEFL test is a standardized test of English. To do well on the test, you should therefore work in these areas to improve your score to get your score. You must work to improve your knowledge of the English language skills that are covered on the paper version of the TOEFL test. You must understand the test-taking strategies that are appropriate for the paper version of the TOEFL test. You must take practice tests with a focus on applying your knowledge of the appropriate language skills and test-taking strategies.